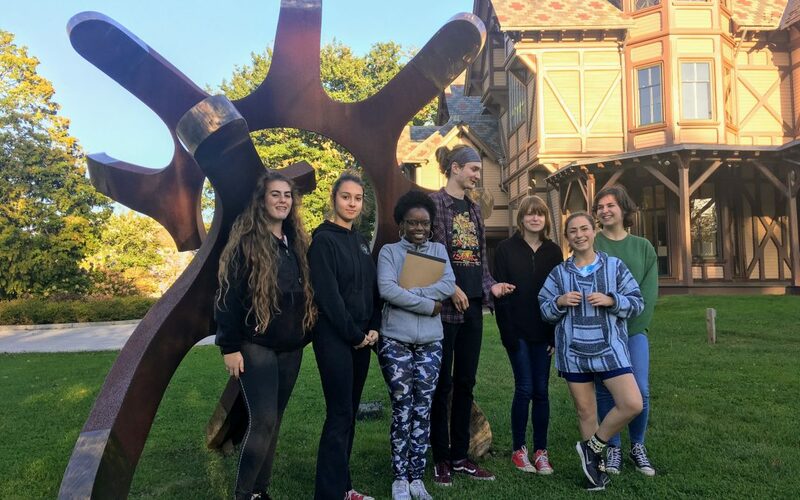 The MuSE Cohort of 2017-2018 walked the museum grounds this week with Executive Director Norah Diedrich, looking first hand at the campus as the students begin work on their museum campus plan. Their project is grounded in the museum wide strategic initiative to improve the experience of the campus green space, better reflect our mission and to foster our place as a community arts anchor. This project embeds the students within the museum organization, a key part of the work they will do during the MuSE Program. The culmination of their experience will include their final proposal for a new campus, to be exhibited in the Griswold House galleries. The students are (l-r): Bella Pine, Ella Menoche, Nijah Johnson, Hollie Sullivan, Kim Pike, Allyson Armin, and Regan Thayer. Public spaces need to be designed with intention in order to achieve the goals of the landowners and most benefit the community. Having a talk and walk with Nora [Diedrich] really made me realize the things that matter in a public space and ask questions like how can we make the space comfortable for everyone? What makes spaces recognizably public? On the empty sides of the Cushing building, we could project little previews of the shows being displayed inside [the museum] to make people want to see the whole exhibition. Muse is Museum Studies Experience for Rhode Island high school students.